This was another great night of varied entertainment. The first act being the 'Coppull Folk Ceili Band' (Ken, Colin, Maria, Christine and Phil), who played a set of Irish dance tunes - jigs, hornpipes and polkas. Then 'Bad Grandad' treated us to a few requested songs accompanied by his amazing guitar wizardry. Pete Southworth finished the first half with some singalongs that enabled the audience to join in. Gary and Vera were amazing tonight with high class entertainment, singing and playing. 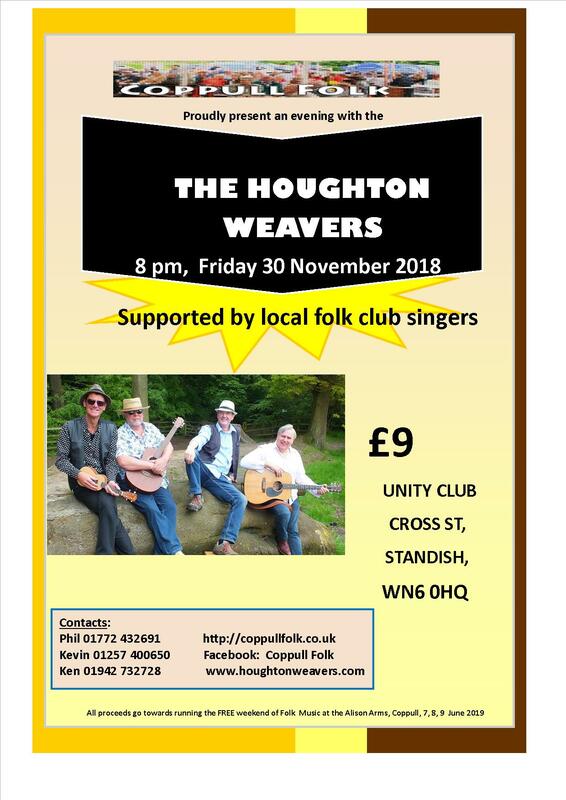 Their set followed the historical theme of the emergence of English Folk Music and we learned a few unknowns along the way - like the miners also had 'blues' type tunes which Gary decided to call 'Greys'. His delivery and humour were brilliant and this new set is surely worth seeing. Vera's harmonies were a delight and her musicianship on the accordion and guitar was a seamless backing to Gary's powerful commanding voice. Vera did a wonderful solo of the Irish set dance 'King of the Fairies' on an English concertina which was a delight. This talented duo are true entertainers and deserved the very attentive audience and the respect they have earned over the years. Thanks to Gary and Vera for coming and giving us such a good night and helping to keep our little festival running. Thanks also to Ken Scalley our MC, to Kevin who works so hard with fund raising, to the Coppull Ceili Band, and loyal supporters Bad Grandad and Pete Southworth. It was such a pity that the evening was not well supported. However you were a fantastic audience. 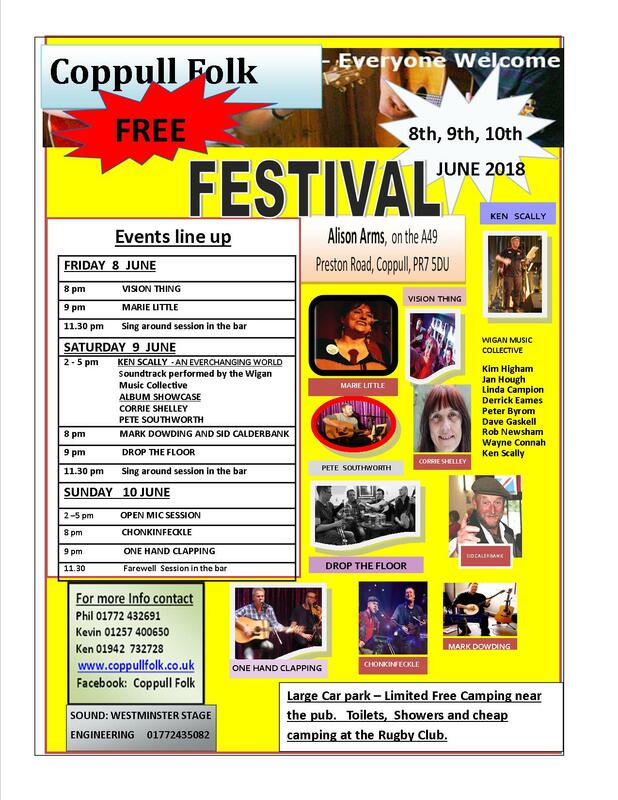 We now look forward to the Festival on 8, 9 and 10 June. We look forward to welcoming you to our next fundraiser concert with Bernard Wrigley, supported by the amazingly talented Jan Hough and Ken Scalley. Admission tickets £8 can be reserved and picked up on the door. Next singaround Wednesday 2 January 2019. 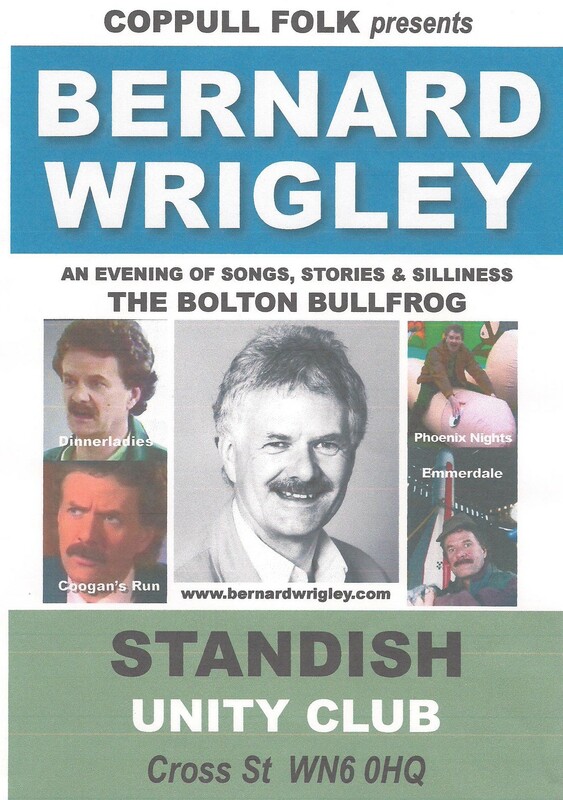 Next fundraiser is Friday 8 February 2019 with Bernard Wrigley. 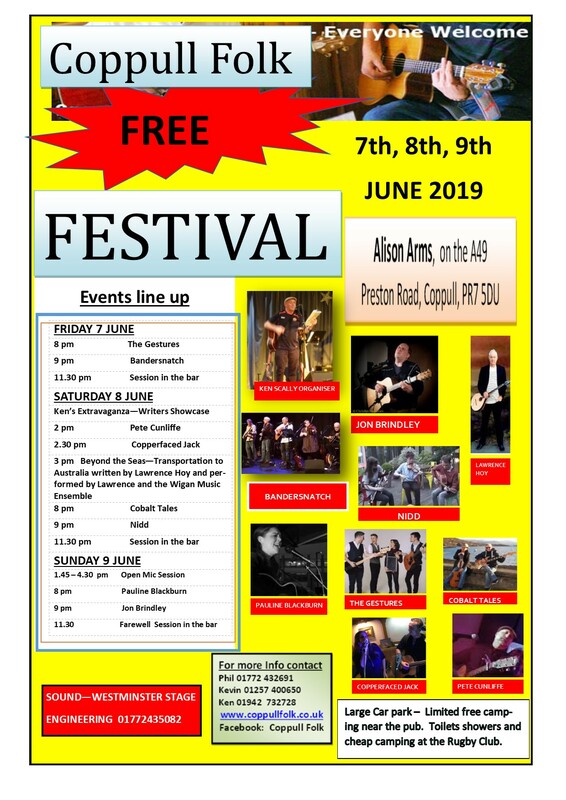 THANK YOU TO EVERYBODY WHO HAS SUPPORTED US AND HELPED TO RAISE FUNDS FOR THE NEXT FREE FOLK FESTIVAL AT THE ALISON ARMS COPPULL IN JUNE 2019. VISION THING opened our festival with their 4 piece harmonic sound and wowed us right from the start. They write their own thoughtful, reflective and topical songs and delivered them with perfect diction and conviction. There was clever bass playing, melodic fiddle playing, excellent guitar playing and delightful singing from Pete and our Shelley. Our audience loved them. We could have listened to them all night. Thank you for a wonderful set. They were a hard act to follow but as soon as MARIE LITTLE got on the stage, she took us to a different world. With that voice, clever impromptu patter, songs about pits, wars, strong women, love and even the Rawtenstall Annual Fair (In The audience without a mic), Marie is a one off one, woman show. This was one of the best Friday nights ever. Thank you to Vision Thing, Marie Little and to Bill and Lesley of Westminster Stage Engineering for the crystal clear sound. Saturday afternoon saw Wigan and environs talent at its best. So many singer-songwriters and talented musicians. Well done Ken for putting it together and Bill and Leslie for the amazing sound. Firstly PETE SOUTHWORTH sang reflective songs about his childhood and life in Wigan many of which feature on his cd. They were delivered with feeling and sincerity. CORRIE SHELLEY took us from the mines to sea ships to the wars and memories of her mother. Her confident delivery and beautiful haunting voice did her songs justice. DEREK EAMES followed with humorous self penned songs about his life ranging from when he got married and had nothing, to his opinion on mobile phones and a tribute to his 4 grandchildren. We all had a good laugh Derek. JAN HOUGH and BAD GRANDAD (Dave Gaskell) delivered a lively melodic set with songs from a wide range of genres including Dylan and Marc Knoffler. These two are fantastic musicians in their own right featuring Dave’s excellent guitar accompaniment and Jan’s Ukulele and bodhran playing. This music, with Jan’s strong voice delivery and Grandad’s clever voice and guitar delivery was ace. KIM and WAYNE treated us to a folk, jazz and blues set and with Kim’s awesome husky voice and Wayne’s harmonies and excellent guitar accompaniment we were treated to another brilliant set. The afternoon closed with the COLIN WINSTANLEY and KEN SCALLEY duo singing self penned songs inspired by local Wigan life such as Coal hole Cavalry and Take me down to Fair. These two with mandolin, guitar and mouth organ have the local patter and delivered an entertaining musical set. All the artists this afternoon could do a weekend festival in their own. Thanks to you all. Thoroughly entertaining. The big crowd that was here on Saturday night witnessed another night of nights with two outstanding performances. The fast perfectly worded diction of MARK DOWDING’S songs was equally matched by SID CALDERBANK’S jokes and ever ending poems, delivered in Lancashire dialect without a stop. They were funny, engaging, sharp and witty. The roars of laughter said it all. DROP THE FLOOR were equally engaging with their pure, close knit haunting sound of fiddle (Martin Baptie), Uillean pipes and whistle (Steven Johnston), tenor banjo (Daniel Burke), and guitar and bouzouki (Richard Moss). Their sets of Irish reels, Jigs, hornpipes, slip Jigs, slides and an amazing slow air had us enthralled all night. 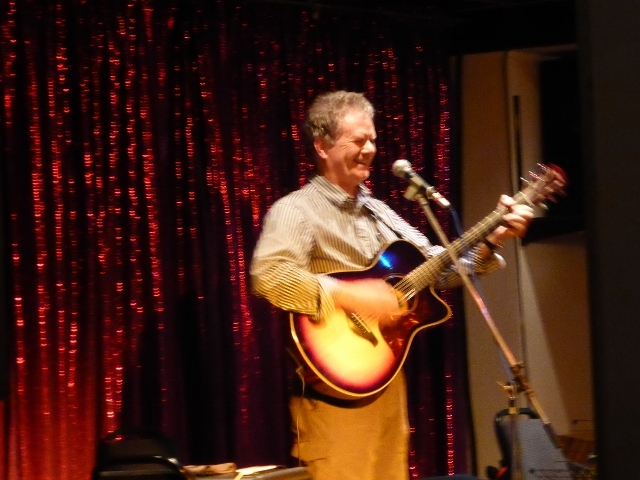 Richard Moss interspersed the sets with well chosen, well sung, Irish and Lancashire songs. This music was infectious, high energy, and technically brilliant. We are so honoured that Drop the Floor came to play at our Festival and share their music with us. Bill and Lesley, thank you for providing crystal clear sound for all the artists. It was so good, the music seemed unplugged and just loud. Thank you to all the artists tonight, we loved you all. The Open Mic was another successful concert with 15 different acts doing 2 songs each. CHONKINFECKLE started the entertainment on Sunday night with their infectious bonhomie cheery manner. Tim delivered the stories/poems accompanied by his "all singing/ dancing" electronic percussion musical instrument, whilst Les provided the music with his 10 string Banjo/uke, his 3 string guitar box and his mouth organ. It is a credit to Les, to be back playing so well after his stroke. These two are a double act and bounce off each other with their tales of Uncle Joes mint balls, the qualities of vinegar, the Lecky mon, night and day life in Wigan etc. We even got free 'Uncle Joes mint balls' thrown into the audience. This was a very entertaining set enjoyed by us all. Thanks to Les and Tim, and for supporting the fundraisers during the year. It was good to see you back at the festival. ONE HAND CLAPPING with Tim on guitar and lyrics, and Chris on fiddle and harmonies, were the final act of the 2018 festival. If we thought we were winding down, we had to think again. Tim and Chris were on fire, with Tim singing and playing of lively foot-tapping up tempo numbers, followed by slow thoughtful songs; and Chris playing apt melodic accompaniments, as well as singing clever harmonies. There were many requests including the Contender, Grace, Raglan Road, from here to Clare, which had the audience singing along, and some of Tim's self penned songs such as Our town, and my favourite Why don't you lay down your arms and come in from the cold. Then we had the lively contrasts like I wish I was back home in Derry, the wall around Las Vegas in Donegal, from Galway to Gracelands, Elinor Rigby, Johnny comes marching home. Tim sings with 100% passion and Chris plays with 100% passion and together they make a fantastic entertaining duo with a very wide repertoire. They also have been stalwart supporters of the festival and it was great to have them back too. Well done One Hand Clapping. Thanks to Chonkinfeckle and One Hand Clapping for a wonderful final concert. Once again, thanks to Bill and Leslie for all your hard work with the excellent sound management. Every act commented on how good the sound was! Thanks to Mavis and Ron for providing the venue, food and beverages, into the wee small hours every night. Thanks to all the acts that performed. Thanks to the large numbers of people who came to the festival and supported the concerts. Thanks to the sun for appearing all the time and helping to contribute to the lovely friendly atmosphere. Lastly, thanks to Ken and the team, and all the helpers who turned up to set up and take down the tent. You all made it another successful festival. The camaraderie, the enthusiasm, and the friendship of the organising team, all the helpers, and all the people that came is something very special.